Adam — Adam Gardiner Fund INC. Very little is really known and understood about AMYLOIDOSIS other than it is a disease which builds up in tissues in one or more organs. There is no known cure although treatment targeting the cells which make the abnormal protein Amyloid may limit production of cells and allow the patient some quality of life and ultimately some cure. Adam Gardiner’s family and friends know about Amyloidosis. Everything about Adam’s life from his earliest years to his early manhood was exactly what any parent would have expected, except that he never did anything in half measure (a trait that would be his trademark throughout his short life). He grew up in a loving family environment where he participated fully in life around that family and ultimately married the girl of his dreams. 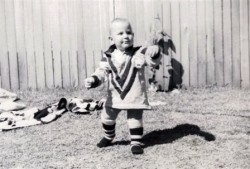 His love of sport emerged at a very early age and continued to become a driving influence in his life. His strong physical presences hid the gentle but fun loving person he was and he naturally became a leader of boys and men as he developed through his informative years. Nothing was too hard and anything could be achieved with hard work, providing it was tempered with humor and fun. Everything indicated a normal life ahead for this young man. Nothing was left to chance. Adam tried all sports, land and water and through this participation grew an extraordinary group of friendships that would last throughout his life. He played at every level, whether it was his sport, recreation or his work and his energy across all of these - knew no bounds. It was never a matter of how far would Adam progress, it was always a matter of when would he get there. Such was the man and his character that he developed others alongside who simply needed to be with him - again across all boundaries. He was a leader whom others have described as “larger than life itself”! However in spite of all Adam’s great strengths & after a brave and courageous fight, Amyloidosis claimed his life at 35. Adam continues as an influence to all who knew him as well as to future generations who didn't. His life is to be perpetuated across his beloved football with Balmain’s Jersey Flegg Player of the Year to receive the Adam Gardiner Memorial Trophy as well as Victoria Carpet Company establishing the Adam Gardiner Perpetual Trophy for Sales Person of the Year. There will be so many ways to contribute to the Adam Gardiner Foundation - all Adam would wish is that you do so in remembrance of a life well lived and shared. Such was Adam’s creed both during his life and for the time he will continue to be an influence.